The first state park in Washington was established in 1915 with twenty acres donated by the heirs of C.X. Larrabee and by Cyrus Gates of Pacific Realty. The suggestion for a state park along scenic Chuckanut Drive came from the Washington state governor, Ernest Lister, in 1913. 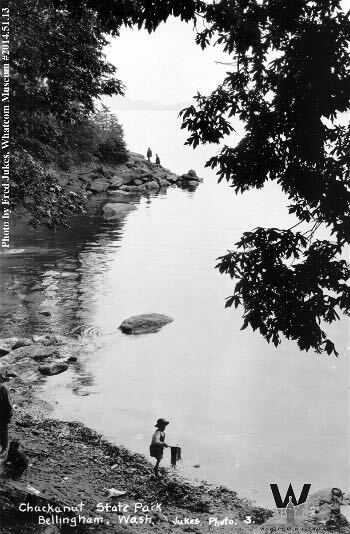 The park was officially dedicated on November 22, 1915, as Chuckanut State Park. 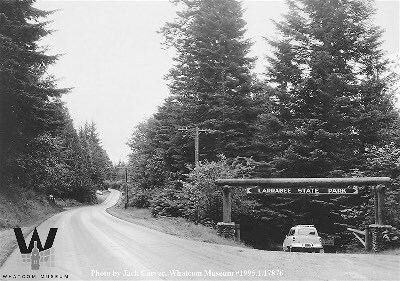 The name was changed in February 1923 to Larrabee State Park. There were not many amenities in the park for the first twenty years. A few picnic tables, beach access and a bath house were the extent of the improvements. Early caretakers, underpaid and under-motivated, were more of a liability than an asset. Some did not take their job seriously, others took their job a bit too seriously. Much of park attendance during this period consisted of bootleggers off-loading their goods to Chuckanut Drive, then known as "liquor runners’ road”. Swimmers and picnickers were in the minority. Finally, in 1935, a dedicated caretaker was hired, a Mr. Dave Johnson. He attended community gatherings in both Whatcom and Skagit counties, advocating for the park, lobbying for funds for park development and supervising the many amenities that are evident in the park today. In 1937, Frances Larrabee and her son, Charles, donated an additional 1,500 acres with neighboring landowners adding to the total at that time of nearly 2,000 acres. Today, the park comprises 2,683 acres and includes 67 picnic sites, 53 standard camping sites, an amphitheater, a boat launch and 8,100 feet of saltwater shoreline. Across Chuckanut Drive from the park entrance, the property extends up Chuckanut Mountain with hiking trails leading to Lost Lake and Fragrance Lake.